in the solar return chart one notes the waning moon in taurus, along with sun - both in the 8th sign to the ascendant.. the 2 or 3 charts that typically get used for israel as libra rising or scorpio rising.. depending on what chart one uses - they will get a different solar return ascendant and etc. etc..
profection ascendant for 2018 is leo, so back to the natal sun in the 8th... all this 8th house/sign stuff suggests to me the theme of death and hopefully some type of resurrection or new life is implied.. i suppose this is always the potential.. we look at the position of the sun in the solar return to gain a better understanding of how the sun will function in this leo profection year..
israels natal sun at 23 taurus is sandwiched by square between saturn and mars at 16 and 28 leo respectively.. generally this makes for a tougher dynamic and i think is in keeping with israels 70 years of history to this date..
the ruler of the taurus sun is venus which in the natal chart is at 4 cancer in the 9th house - 10th sign. it would seem strong foreign support, especially from the usa - a country thought to be cancerian too, and the uk - a cappy country as i think of it - makes sense... it seems unconditional with no strings attached and defies logic on some level - at least how i understand it..
the solar return angles 3 libra ascendant and 3 cancer midheaven - are right where this ruler of the sun is... venus has been going thru the transit of saturn in cappy opposite it's natal position... thus - saturn shows up on the angles of the solar return chart, boding a more challenging year for israel.. saturn rules the 4/5 houses in the natal and solar return chart and is debilitated in the natal chart being in leo.. it has some accidental dignity being in the 10th house area... it would seem to me that natal venus is under pressure and in for a challenging year.. the whole chart - solar return and back to natal chart - suggests a more challenging and difficult year for israel..
the mars-uranus square is very close and suggests some surprises and shocks that will be hard to process..this is true also given the fact it hits the angles in the solar return chart, as does pluto at 21 cap. mars rules the 7th house in both charts using the libra 4pm chart as basis.. i suppose the surprises might come in the relationships or open warfare that israel engages in or is on the receiving end of..
it seems to me that israel has gotten 'what it wanted' from the usa here with usa saying they will move the usa embassy to jerusalem.. based on the response of other countries to this move, it remains to be seen if this is a good thing, but this is how some folks inside israel view it favourably.. i am really mystified how israel moves forward here in a way that works with it's neighbours towards peace, as opposed to war.. i guess there is a fine line between the 2, but it would make more sense to me that movement was made on those in power to seek peace first and foremost.. it doesn't look like that is happening here from where i sit.. although we think of mars as the god of war and venus as the god of love - i don't know if peace can sub for love - it seems like israel is more driven by mars then venus.. the saying those who live by the sword die by the sword is relevant..
here is an overlap with israel 4pm chart inside and 2018 solar return on the outside..
is sandwiched by square between saturn and mars at 16 and 28 leo respectively.. generally this makes for a tougher dynamic and i think is in keeping with Israel's 70 years of history to this date.. I believe some authorities (Bonatti?) would consider the Sun to be besieged in this situation, and that certainly fits. Also note Moon rules the return MC from the sign of her exaltation, albeit from the 8th house. The "natal" angles repeat in this SR (by sign) making this a significant year. good points. also worth noting that Venus rules both the ascendant and 8th house, and disposits both luminaries while being cadent in the 9th house. the 4th-ruler, Saturn, also brings up issues of boundaries and state lines, though we can also easily bring in connections with death and mortality when Saturn governs the 4th. Saturn is at 8º Capricorn, retrograding back to an opposition of the midheaven and square to the ascendant/descendant axis. the Moon's movement toward the Sun in the 8th, combust, emphasizes the emphasis on life and death that you've brought forward. I had trouble reading the black chart you posted James, so below will post a chart of Israel's founding. I didn't do the solar return. classic image of violence with the two malefics in Leo, besieging a luminary. 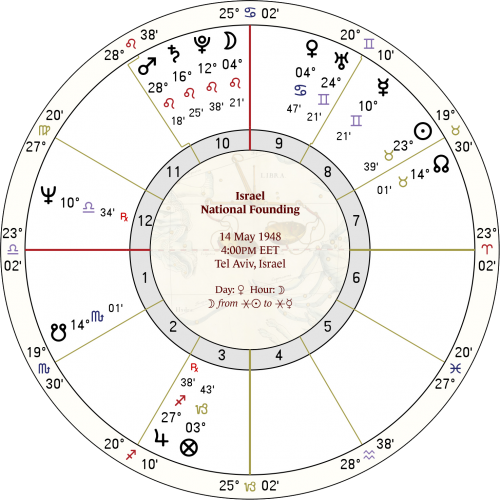 I think what strikes me as interesting is that Israel shares a Mars degree with Trump, and Israel's Sun is both on Trump's midheaven and just a degree out from the Saturn/Jupiter conjunction of 2020. seems clear why Israel should be called into such sharp focus by the Trump administration at the closing of the earthy triplicity conjunctions. but the cadency and laxness of Venus generally should also imply that the actions which lead to death in this year lack the finality which could spell the end of the question of Palestinian statehood (i.e., if Venus had been angular and either well-dignified or received by a superior planet, 4th-/10th-ruler, luminary or benefic, it might instead argue that actions resulting in deaths this year -- right, wrong or indifferent -- lead to something more finite). it's the natural laxness of Venus and her cadency in Gemini, with her dispositor Mercury peregrine on the 8th cusp, which makes me think Israel will be making a great deal of sloppy moves this year that feel like victory but don't show up as such in the long game. venus has been going thru the transit of saturn in cappy opposite it's natal position... thus - saturn shows up on the angles of the solar return chart, boding a more challenging year for israel..
this took me a minute to figure out what you're saying -- I get it now. you're saying Israel's 'natal' Venus at 4º Cancer is undergoing a Saturn transit by opposition. 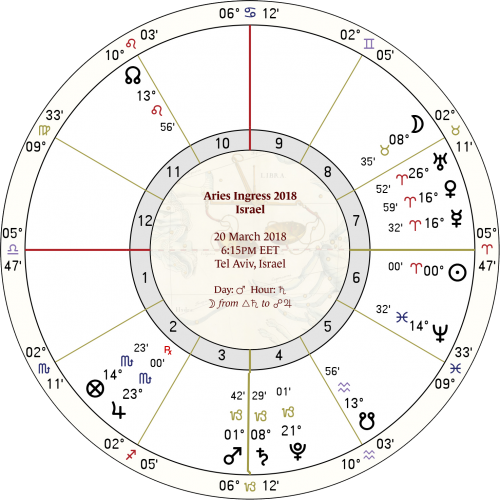 yeah, good point -- a big deal, too, as Venus is the ascendant-ruler of Israel's founding chart, and disposits the Sun in that chart and the Moon in 2018's Aries ingress (more on that below). just a nitpicking point to say that 'accidental dignity' is an oxymoron. dignity is something inherent (and is only measured by a planet's relationship to its environment, i.e., zodiacal degree -- a king in his kingdom is able to express his dignified status, whereas in enemy territory he's got no leg to stand on and his inherent dignity is no longer at easy access), not circumstantial (measured by every other consideration -- phase, aspect, location, motion -- circumstances of situation). Saturn in the 'nativity' of Israel is accidentally fortified or strengthened. but there is no dignity to pick up from the circumstantial. an ill-dignified planet well-fortified makes the most of what it's got, but if not consciously worked with, will fail to deliver in the long run. it would seem to me that natal venus is under pressure and in for a challenging year.. the whole chart - solar return and back to natal chart - suggests a more challenging and difficult year for israel..
it seems to me that israel has gotten 'what it wanted' from the usa here with usa saying they will move the usa embassy to jerusalem.. based on the response of other countries to this move, it remains to be seen if this is a good thing, but this is how some folks inside israel view it favourably..
what I hadn't exactly picked up on here is that the chart for Israel's solar return is only a half-hour off of the time set for the embassy's opening ceremonies (at 4pm). if we wanted to measure the effects of this, we could just move the chart from Tel Aviv to Jersualem, and move it forward to 4pm, and compare this chart to those for other mundane cycles in play. personally it looks a bit grim to me, and it certainly isn't a wise move from the point of view of US diplomatic efforts. on a recent newscast, a dispassioned speaker made the most excellent point that in choosing to acknowledge Jerusalem as the capitol of Israel and to open an embassy there, the US has stepped out of a position of neutrality and has effectively disqualified itself for being a leading voice at any negotiating table with Palestinian authorities. and now, each president after Trump will need to figure out their speaking points re: Israel and Palestine, as choosing a neutral stance is going to be harder and harder to accommodate with an embassy open in one nation but not the other. I can't see how the US won't come to regret this. i am really mystified how israel moves forward here in a way that works with it's neighbours towards peace, as opposed to war.. i guess there is a fine line between the 2, but it would make more sense to me that movement was made on those in power to seek peace first and foremost.. it doesn't look like that is happening here from where i sit.. although we think of mars as the god of war and venus as the god of love - i don't know if peace can sub for love - it seems like israel is more driven by mars then venus.. the saying those who live by the sword die by the sword is relevant..
check out the IDF's social media feed. Twitter, particularly. there's no interest in moving toward peace. the great irony of being signified principally by Venus: the illusion of peace. also, it may be that Venus is the ascendant-ruler of the founding chart, but Mars is a key player in that figure. he sextiles the ascendant, is in square to the Sun (and actually, the Sun is translating the light of Saturn to Mars, giving Mars in Leo -- often traditionally described as 'bloody-minded' -- a tremendous deal of influence). personally I was struck by the connection to the US Aries Ingress and Israel's (shown above). the US has the Saturn/Mars conjunction on the descendant, Israel has it on the IC -- almost like the Saturn/Mars influence was magnetized between them, and it took a decidedly 7th house feel for the US whilst manifesting in a 4th house reality for Israel. and that natal Venus/transiting Saturn opposition you discussed above, James, is on the angles of the 2018 ingress, bringing it into sharp focus. as Uranus moves into Taurus and starts to kiss that solar return Moon, we'll see some things heat up. but all the more so when Uranus comes to 10º Taurus, repeatedly from 2020 to 2022. this is the Moon of the embassy open, and Uranus will station there in August 2020 (Rx), and again in January of 2022 (D). and some of those charts, if you look at what's happening at the time of Uranus's station, eerie connections jump out at you. 15 August 2020, 4:26pm in Jerusalem. Moon at 8º Cancer, Venus at 7º Cancer -- highlighting these degrees again. 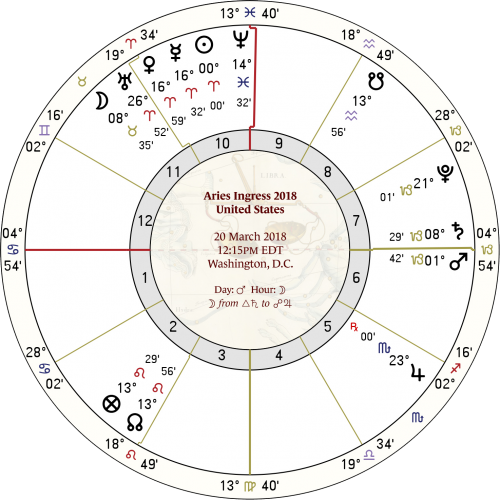 Mars at 23º Aries, Sun at 23º Leo -- bringing the 7th house of the nation's founding and the natal Mars back into focus. ascendant is 20º Capricorn, near the IC of the founding chart, and the MC is 8º Scorpio, opposite the embassy's Moon and transiting Uranus. 18 January 2022, 5:25pm in Jerusalem. ascendant and Moon at 5º Leo, square the 8º Taurus/Scorpio mess and only 1º out from Israel's 'natal' Moon. this is all opposed Mercury at 8º Aquarius and Saturn at 13º Aquarius. midheaven at 26º Aries, bringing the Mars emphasis from the previous station and Uranus from the embassy's founding. Mars will be at 25º Sagittarius, completing a grand trine now to the echoes points of mid-20s Aries and Leo. Venus will be at 13º Capricorn, on the embassy's natal Saturn, and the Sun will be at 28º Capricorn, the embassy's Mars. we certainly haven't seen the end of this, but I don't think anyone expected this to go away quietly. ** please excuse any typos, haven't gone through to re-read to ensure spelling/grammatical mistakes have been corrected. first off - thanks so much for posting at skyscript recently.. it is great to have someone who is interested, keen and has a good knowledge of astrology posting here.. thanks! i apologize for not being great in wording what i have to say, but i am glad you picked up on a lot of it and added many additional and interesting comments to it all.. i want to start with your comment on the timing of the usa embassy opening in jerusalem yesterday.. the chart below is for 4pm jerusalem... they didn't use an astrologer to help with the timing..
this reinforces much of the 2018 solar return data as already noted.. t saturn is on the angles, which is a mixed bag being in cap, so close to the angles and in the 4th house essentially..
i mentioned accidental dignity for saturn in leo in the 10th in israels 4pm chart.. i thought that was what it was called, but -you have articulated better - accidentally fortified or strengthened - that is more clear and less confusing..
i had looked at the ingress charts for israel and washington and might have even commented on them in a thread i did which i can't recall the title - prediction for 2018 here on the mundane thread - or something like that.. those are good are valuable observations noting the coincidence of what is in the angles of both charts - mars/saturn... it motivated me to do the summer ingress charts which show a similar picture but perhaps ever so slightly better.. while the sun also makes it into the angles - a positive - in the usa chart neptune is on the midheaven - less positive..
israel cancer ingress first - usa one immediately below..
i want to come back to your comments on venus cadent in the 9th - not being of much help.. what i was trying to suggest with the degree of the midheaven in the 2018 solar return - 3 cancer - was how venus at 4 cancer 47 in israels national chart is brought out into an angle via the solar return.. now, i don't know how this works exactly, but my impression is that venus who be strengthened here and in a position to act.. - now whether the opening of the embassy is an expression on the part of venus in the 9th - foreign support from usa here - i suppose it is difficult to say for sure.. it looks that way to me.. and - all the dead palestinian people on this same day - seem to conform with this venus - ruler of the 1st/8th - coming out on an angle too... but i could have this all wrong and it could be coming from just the 8th house placement - of sun and moon - moon being the ruler of the 10th and in the 8th both in the embassy chart and the 4pm israel chart..
either way - i do see this as a challenging year for israel. i can't help but think more people within israel would question just how sustainable israel is in the face of all that is happening at this point in time..
thanks for your informative comments! gods, everyone has been so nice to me since picking up a few threads this week. I'm just happy a forum like this exists. I've started penciling it into my diary to get on here more often -- I miss the connection with others who are exploring similar problems/questions. but thank you for the kind words, glad to have someone like you to brainstorm with! i had looked at the ingress charts for israel and washington and might have even commented on them in a thread i did which i can't recall the title - prediction for 2018 here on the mundane thread - or something like that..
ah, this is why I fall away form forums for long stretches of time -- because you go away for a month and realize you're late to every party, so what's the point in coming back? LOL. those are good are valuable observations noting the coincidence of what is in the angles of both charts - mars/saturn... it motivated me to do the summer ingress charts which show a similar picture but perhaps ever so slightly better.. while the sun also makes it into the angles - a positive - in the usa chart neptune is on the midheaven - less positive.. I'll tell you what's sticking out to me in the Cancer ingress for Israel is the 10th-ruler in the 1st, the ascendant-ruler being disposited by that Sun in the midheaven (if you allow a bit more than 5º, which I might be willing to do) with Mercury, and the Sun ruling the 11th. just looks like a lot of rhetoric, a lot of placating, a lot of 'trust us, this is the situation', a lot of optimism about the future. but Mercury rules the 12th, and to have Mercury in the 10th in square to the 10th-ruler in the 1st, I think we can expect a lot of important details to be subtly glossed over. the 1st-ruler Venus in opposition to 7th-ruler Mars, Mars then stationing.. I think we're getting an image here of a really hard look at casual violence like what we're seeing in Gaza, the conversation and topic of war and the war machine. all superior planets are retrograde or stationing Rx.. I think the summer months will be a retrospective and obstacle-laden time for countries with cardinal signs on the ascendant at the Aries ingress. i want to come back to your comments on venus cadent in the 9th - not being of much help.. what i was trying to suggest with the degree of the midheaven in the 2018 solar return - 3 cancer - was how venus at 4 cancer 47 in israels national chart is brought out into an angle via the solar return.. now, i don't know how this works exactly, but my impression is that venus who be strengthened here and in a position to act..
ah, I see what you're saying now. I apologize for not making better sense of that before -- it's pretty clear now when I go back and read what you wrote before, must have just been a bit unfocused. others are likely to hold other opinions. I don't know that I think this makes Venus more powerful to act, per se, but brings into focus who or what Venus symbolizes in the national chart. so again we're brought back to life and death, 1st and 8th, but of course you're right that Venus's placement in the 9th in the natal chart shows external support (Venus would provide that support). but, we have to remember that the 9th house is also the 12th from the 10th, and can indicate gov't/leadership efforts which unfold to the demerit of those same leaders in many years' time. you would expect that to be the case if a natural malefic was the 9th house contact, which isn't the case here, but we do have a natural/circumstantial malefic in Venus as she rules Israel's 8th house by sign and the 6th by exaltation, and is currently under intense pressure from the Saturn opposition. so I don't know that this is going to empower Venus so much as bring the topics under Venus in the found chart into sharp focus, particularly so in the summer when that degree hits the MC of the Cancer ingress and the Sun (illumination) is hitting that spot within a few degrees. I'm a little less optimistic, but full disclosure that I'm pretty livid with Israel right now (and have been since I've been conscious of the struggle there) so might not be entirely impartial on my end. but who says an astrologer has to be impartial! if I saw this and was advising Palestinian leaders, for instance, I would say that these aspects give the UN and Palestine a platform to really call Israel to account (and those who aid her in such violent measures). you know, you read about the astrologers in the Second Civil War in England. Lilly & friends on one side arguing the astrology favors Parliament, Wharton & cronies on the other saying the astrology supports monarchy. when I first read that, I thought, "wow, so they must not have been very good to see the same thing and think it could mean anything." I later realized that I had it all wrong. it wasn't about the astrology saying what was going to happen; what the astrology really did was support the conversation of monarchy-or-no-monarchy, and it was up to anyone looking at the symbols and signs to make best use of that astrological climate to steer the conversation where they saw best fit. so I personally take the same approach here and in all mundane work (or, that's my position today) -- that the astrology doesn't say what must happen, but shows what doors are unlocked at the moment. it's up to us as astrologers and people to layer in the conversation of ethical living. but it doesn't amount to much unless someone comes to activate these connections, to show (symbolically) that Venus may be the goddess of love and signifies the strength of the people (ascendant-ruler), but in Israel's chart, she also holds the keys to death (ruler of 8th) and servitude (exaltation ruler of 6th), and we cannot understand Venus in that chart without acknowledging this. and this 'activating of connections' is what I was on about with Sat/Mars on the 7th in the US Aries Ingress, and on the 4th in Israel's -- the link was formed, and activated by the embassy's open. now whether the opening of the embassy is an expression on the part of venus in the 9th - foreign support from usa here - i suppose it is difficult to say for sure.. it looks that way to me..
hard to disagree with you. but Venus promises a lot. question is, if pressed, can she deliver? and - all the dead palestinian people on this same day - seem to conform with this venus - ruler of the 1st/8th - coming out on an angle too... but i could have this all wrong and it could be coming from just the 8th house placement - of sun and moon - moon being the ruler of the 10th and in the 8th both in the embassy chart and the 4pm israel chart..
we're in complete agreement here! it's a question that we've been struggling with for 70 years and no where near solving. seems to me the stakes just got higher -- the last thing we need right now with trigger-happy governments. thanks for your kind words and astro thoughts too! in retrospect i think i am coming to the conclusion - with your influence! - that venus in the israel chart is only good for so much, and maybe not so good for a whole lot more given what it rules in this 4pm israel chart and it's location in the 9th.. so, for the 2018 solar return midheaven to be close to the venus position in the natal chart seems to suggest more hardship then anything else, in spite of it's being venus..
you make a lot of good observations in all your post.. it is interesting how astrologers respond to the topic of the israel / palestine conflict.. this seems to have been set in stone back in 1919 in the treaty of Versailles in paris.. the 3 world leaders after the 1st world war - britian, france and the usa decided how to divide up the planet.. it was power politics and it continues to have ramifications in the world today.. perhaps the most challenging topic that was worked out in 1919 has to do with the idea of giving israel it's own country in the middle east.. here we are 70 years later after they established this in 1948.. i don't think it has worked..
i am not impartial or capable of being objective in all this either.. i see the conflict getting worse, not better.. i don't see the usa as an honest broker in it all either..
Israel chart was rectified to 16.15.07 EET Asc 26Lib15' by Alexander Marr in 1985. Over the years I checked this chart with many events and I don't have any doubt that it is the accurate rectification. Mars in the solar return is on IC of Israel chart and mars will be station on 27 August at 28Cap36' orb of just 3' from the radical IC. The converse solar return is no less important (casting for May 1878): Sun conjunct Pluto and square Uranus, Saturn close to radical IC. Because of the slow motion of Pluto, it will be conjunct Sun also in the converse solar returns for the years 2019, 2020 and 2021. At the end of August 2018 converse transit Uranus will conjunct radical Mars. At that time primary direction in topocentric has Mars conjunct Uranus. Interestingly, at the moment Mar will be station on 27 Aug 2018 at 14.06 UT, it will be right on the Asc. apparently israel has not met the demands of un resolution 497 from 1981...perhaps this feeds into the developments happening at present in southern syria.. i think it does..
here is an overlay with 4pm israel chart inside and un res 497 outside.. one can see what a pivotal event that was for israel from an astro pov.. one wonders how the saturn-pluto conjunction on the angles in this 1981 chart looks like in the 2020 saturn-pluto conjunction back to the 4pm israel chart here as well.. obviously this conjunction of sa-pl from 1980 area is being repeated in late 2020..
here is the solar return for 1981 off the 4pm israel chart. here is an overlay of the 4pm israel chart with the 1981 solar return on the outside..
speaking of 1981 charts - the 2020 chart that i have been talking about for some time which has the next jupiter-saturn conjunction, is obviously an important year from a mundane astro pov... it might be worth taking a look at the 2020 solar return charts for a number of countries at this point in time..